The decentralization of currency is confounding to the layman, confrontational to the establishment, and a source of consolation for millions of daring investors. Director Alex Winter has developed a knack for exploring misunderstood elements of technology in several of his documentary films. 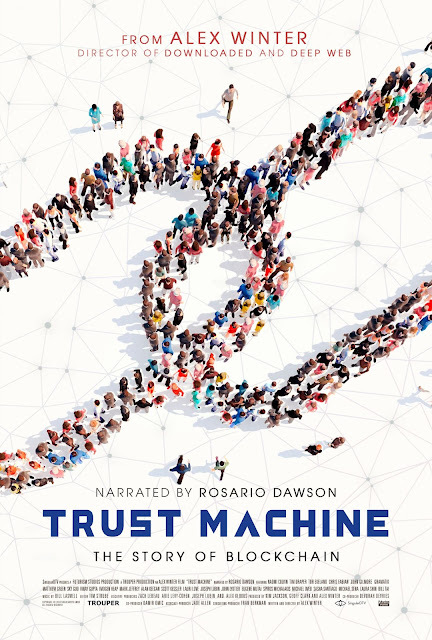 In DOWNLOADED he made sense of Bit Torrent, in DEEP WEB he explored the often maligned non-indexed corners of the internet and in his latest film TRUST MACHINE THE STORY OF BLOCKCHAIN, he makes takes on the technology that enables cryptocurrency like Bitcoin. Is blockchain a scam? Or is it simply a way for nefarious individuals to purchase illegal goods and services on the internet? No and no. As Winter explains in his film blockchain is a brilliant way for digital information to be transferred but not copied. It is essentially an open source ledger that allows for two parties to conduct a transaction in a way that is verifiable and perminent. In other words, no one has administrative privileges over the data. That's why Wall Street and K Street are up in arms. Central authority over financial transactions are an incredibly powerful tool a government can wield to control and monitor its citizens. As an American with a fairly myopic point of view its not always easy for me to see how technology like blockchain can empower people who live under tyrannical rule. Thankfully filmmakers like Winter have a far less narrow worldview and take the time to films like TRUST MACHINE. UNICEF has embraced the technology as a way to assist refugee children and fight against world hunger. The applications for blockchain are virtually limitless. The next time a naysayer is explaining the dangers of cryptocurrency ask yourself, why? What do they have to gain? What do they have to lose? Or do they have an agenda that's not readily apparent? Far more than just an explanation of complex technology, TRUST MACHINE is vital. An important film that should be seen by readers of both Wired and Entertainment Weekly. Winter has taken dense material, that even those of us who are technologically savvy, find confusing and made it approachable. He presents a human story through the lens of ones and zeroes. Watch this film.